Navigate through the information pages by clicking on the icons at the top of the page. I have always been fond of history, which is something China can offer in abundance. Over the past decade I have roamed innumerous historical sites all over China. I have explored tombs, ruins of old capitals, ancient waterways, antique relics, historic structures and a host of other interesting stuff. Some -very few- of these items have found their way to my web pages; most are just still thousands of photos on hard disks or books, brochures and tickets on my book shelves. One place which eluded me for a long time was the Ming tombs. Rather embarrassing considering that I was living less than two hours driving time away when most people have to travel by air for many hours just to get to Beijing. Finally, in 2006-2008 I took the time to trawl through the Ming tombs. These pages tell the story. One place which eluded my for a long time was the Ming tombs. Rather embarrassing considering that I was living less than a two hours drive away when most people have to travel by air for many hours just to get to Beijing. Finally, in 2006-2007 I took the time to trawl through the Ming tombs. These pages tell the story. When people died they went to the netherworld where their soul would continue "life". Hence it was important to equip the tombs with all the things necessary to continue "life" in earthly style and to entomb items which evidenced the wealth and status of the deceased. Funeral rites and tomb layouts changed with the development of society. What did not change was the belief in the "soul" and a life after death. Emperors and kings were the mightiest and so their tombs were the grandest. In China, burial style and tomb extravagance peaked during the Ming dynasty (1368-1644) making it the most interesting deep dive. 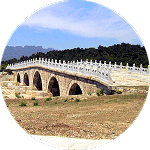 Click now for more details on burial development in China. It can be a little confusing with the many tomb names and the many Ming emperors. Wouldn't it be convenient with an index that would allow for a simple look up by emperor and then obtain his basic details and the name of his mausoleum? Or what about an entry the other way around -know the tomb and get information on the tomb occupant? Or forget all of that and simply look up everything in simple chronological order? The front section of each mausoleum was intended to be a miniature replica of the Forbidden City. Twice a year the deceased emperor's son, the current emperor, or a prince would pay his respects to his ancestor with a visit to the mausoleum. The ritual from arrival to departure was quite elaborate and was strictly adhered to. Each individual building in the front section of the mausoleum served a particular designated purpose in connection with the rituals. Upon arrival, the emperor would make sacrifices in the silk burning ovens right inside the front gate after which he would enter the building on the left. Inside he would change to a special outfit in preparation for meeting his ancestor and pay homage. 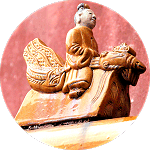 Belief in the interaction between the stars, planets and earth topography originated in China in the 10th century B.C. And it thrives happily to this very day. The quasi-scientific concept of geomancy surmises that earth is a living organism and that the all-essential "qi" flows through our bodies and all matter us. Wind (feng) spreads qi but water (shui) retains and conserves it. Curved lines -as found in meandering water flows- favor good qi, whereas evil spirits ("sha") follow straight lines and angles -notably triangles- prevent any flow of life giving qi. 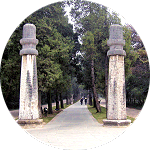 The Ming tombs are located in as perfect a natural environment to good fengshui as can be found. This page shows a map of the tomb area with some of the key characteristics explained. The Northern one? Are there really two? 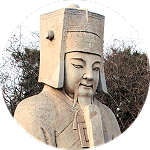 The first Ming emperor was buried in Nanjing and his tomb, Xiaoling, had its own Sacred Way. All other (well, almost all) Ming emperors were buried north of Beijing and this overall cemetery had its own, main Sacred Way. Not really, there are actually three if you count Xianling in Hubei Province, the tomb of Zhu Youhang, father of the Jiajing emperor, the 11th Ming emperor. 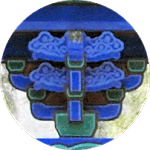 This page will concentrate on the northern Sacred Way, that is, the one in Changping county north of Beijing. 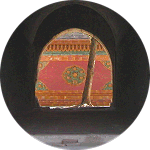 The Ming broke away from the cemetery traditions used by the Han, Tang and Song. 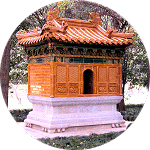 Ming mausoleums typically consist of a round grave in the rear and square or rectangular courtyards in front. This is well aligned with the old maxim that "Heaven is round, the earth is square". The body and spirit of the dead rested peacefully in the round heavenly section in the rear. On the other hand, the spirit could wander around the front square sections complete with buildings and gates similar to the buildings and palaces in which the deceased had lived. This would very much make it feel at home. Moreover, the square sections were the interface between the living and the dead. This is where the visiting authority would call on the spirit of the deceased and perform various rituals in his/her honor. It was believed that the dead would acknowledge these favors by in return giving luck, wealth and health to those who attended the rituals. Find it difficult to keep track of all these special terms and names that are flying around? For instance, what is the name of this structure pictured left? Well, I find it hard too. 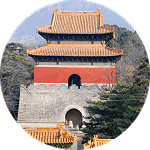 So on this page you'll find a neat and "easy to look up" dictionary covering all the main terms found in or used with the Ming tombs. Some of the entries are deliberately duplicated in Chinese for the sake of comprehensiveness. Terms in the explanations, which can be looked up separately, are emphasized.